My lovelies, I want to share with you a new feature that's going to be popping up on your feed every evening this week! I've always loved reading about bloggers 'Top 5's' or 'Most Loved' products. Here in Blogland, we tend to get locked on a particular product and sometimes it's all you hear about, but in reality, I still tend to grab different products everyday depending on what suits the situation, or what look I'm going for. There is never just 'one' foundation for me, or 'one' mascara I always reach for, so I wanted to share with you all my beauty favourites, and each day I will showcase my selection of go-to beauty products, from drugstore to high end! Today I want to talk foundations, getting down to the basics for a good base. For days when I need that little extra sumfin sumfin, I've always turned toward my old faithful Laura Mercier Silk Creme Foundation. From the moment I first touched the brush to my face, I was in love. The coverage is unbelievable, and doesn't leave you with that 'caked on' appearance. I'll always turn towards this foundation for days when my skin needs a little extra help, or when I need it to last all damn day. Another goodun' I've recently discovered is the Giorgio Armani Luminous Silk Foundation. It's been all over your feed, I'm sure, so I won't go too in depth, but there is a reason everyone raves about it. I have received so many compliments whilst wearing this foundation, it sits so well on and it doesn't budge! For days when I just want to slap on something light and easy, but with good coverage, I use the Loreal True Match Foundation. I've raved about this foundation so many times before, and even after the Luminous Silk entered my life, I still have reached for this foundation countless times. For a drugstore foundation, it is so surprisingly good! It does contain SPF though, I think, so I wouldn't be using this on nights out when I know my face might see a flash (ugh). My last two have been go-to foundations in the past, before Laura Mercier made it's way into my drawers, and I still find myself reaching for them on occasion. The Bourjois Healthy Mix Serum is one of those foundations I can use on days where my skin is treating me well, and I just want something light to even out my skintone. I can apply it with fingers, and it's on and done in a matter of seconds. The Rimmel Match Perfection I generally use in the same way, but the coverage is slightly fuller, but leaves the face looking and feeling fresh and dewy. Both these foundations do tend to have quite a strong fragrance to them though, so if this is something that bothers you I would probably stay clear! The Rimmel offering in particular has quite a unique scent, which does bother me on application, but does tend to settle down eventually. I would like to make a special mention to the Nars Sheer Glow Foundation which just made it's way into my life a day after I shot this photo. I've only used it twice but already I'm in love. I would place it in between a medium to full coverage, as it is very buildable. I would not exactly say it's 'sheer' at all, actually. But I do tend to apply foundation with a heavy hand, so perhaps it could be classed as a light coverage too! We all have our 'Holy Grail' foundations I'm sure, but are there other foundations that you still find yourself reaching for every other day? 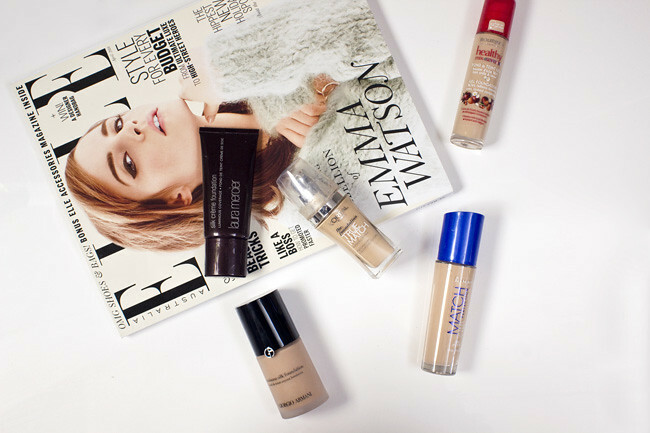 I only own 2 foundations at the moment - the Laura Mercier Silk Creme and L'Oreal True Match. The Laura Mercier is still my favourite but I like wearing the L'Oreal to work. I really want to try the Giorgio Armani Luminous Silk and the Nars Sheer Glow foundation.